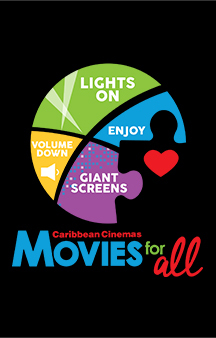 MOVIE SYNOPSIS: Caribbean Cinemas is pleased to present Movies for All, with the purpose to provide a pleasant environment for children, youth and adults with autism or special needs, when going to the movies. These showings will have the lights up and the sound turned down so they feel comfortable and free to express themselves as they watch the film. The showings will be on certain Saturdays at participating theaters. The ticket price will be the same as the regular rate of cinema.